You’d rather eat a piece of cardboard than a kale salad. I get it. It’s kinda bitter, the texture is weird and it’s just not all that appealing. I want to change your mind about this. Besides being a trendy food right now, it is actually REALLY good for you and can be prepared in a way that you’ll enjoy it. Trust me. The trick is to prepare it in a way that gets rid of that bitterness and strange texture. If you’ve read anything about kale before maybe you’ve seen instructions to “massage” your kale… *rolls eyes* Ain’t nobody got time for that! I’ve never massaged my kale and I don’t intend to. I typically eat kale sauteed in a little olive oil. Then I add other flavors to it. If I eat it raw, I mix it in a dressing and let it sit in that for a few hours. It’s one of the only types of salad you can leave in a dressing without it getting soggy – it actually makes it better. So let’s cut to the chase. This recipe is so simple. I buy all the ingredients for it at Trader Joe’s and there’s little prep involved. This salad is good warm or cold. When you first prepare it, it’s warm, but it keeps well in the fridge for a few days and is good cold too. You don't need any seasonings because the tahini sauce already has lots of flavor! Saute the raw kale in a pan with olive oil over medium heat. It will wilt down the way spinach does but not as much. This should only take about 5 minutes. Then throw in the tomatoes and let them warm up in the pan for a couple more minutes. Mix the tahini with a tablespoon of water in a jar and stir together with a fork. This is just to make the tahini a little more runny so that it can coat all the kale well. 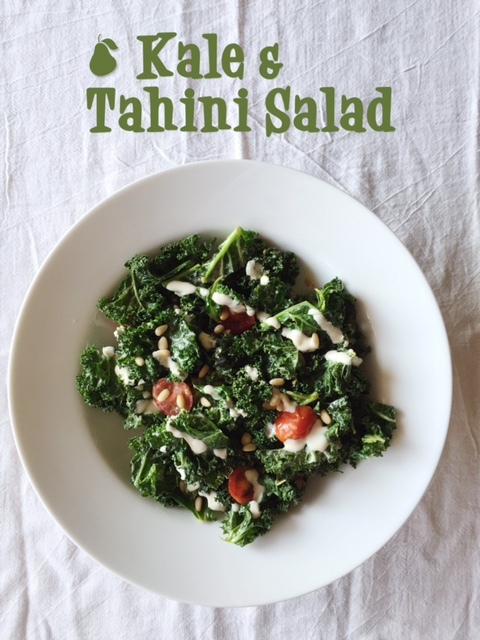 Toss the kale and tomatoes with the tahini in a big bowl and top with pine nuts when served.